BlueSkyBlue have been working with Sacha Dench ("conservationist and adventurer") and the team at Wildfowl & Wetlands Trust (WWT) since Spring 2016 to make a set of thermal flying suits suitable for them undertaking the 4,500 mile journey from Russia to the UK - "Flight of the Swans". Sacha started on the Pechora Delta on Russia’s northern coast on 19th September in her paramotor to embark on the epic 4,500 mile journey following the migration of endangered Bewick’s swans. 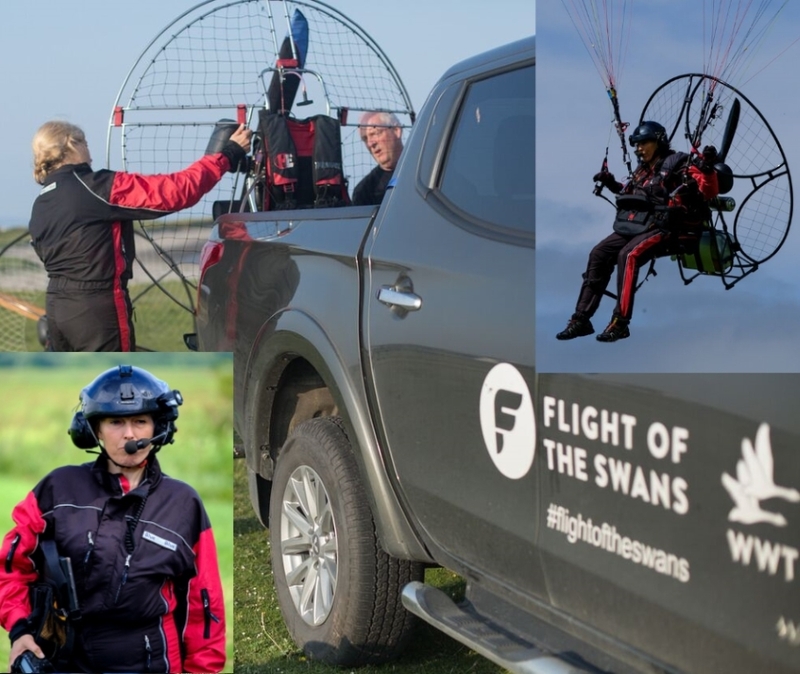 Early this morning, conservationist and adventurer Sacha Dench from the Wildfowl & Wetlands Trust (WWT) took to the air above the Russian tundra in her paramotor at the start of her 4,500 mile journey following the migration of endangered Bewick’s swans. A light tailwind gave Sacha Dench ideal conditions to start her journey from the Pechora Delta on Russia’s northern coast. Over the next ten weeks she will fly across northern Europe and then cross The Channel and continue to the swans’ most westerly destination: Slimbridge Wetland Centre in Gloucestershire, UK. "At each point along the journey she will spend time with the people who live along the swans’ path, who may have clues as to the decline of the swan population. Over the last two decades, the number of Bewick’s swans making the journey back across northern Europe has almost halved. Researchers have identified several dangers that the swans face, but the exact reasons behind their decline remain a mystery."